Hello, my name is Olivia Rose! 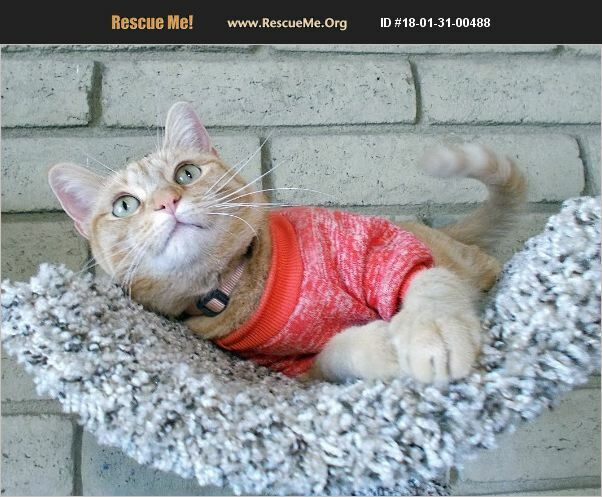 I am a 2 year old Orange Tabby girl! I am such a beauty with my vibrant coloring and mesmerizing green eyes! I am very smart, outgoing, adventurous, and I a Certified Super Snuggler! You might have noticed that I am dressed in the latest styles of cat-wear! :) Yes, I am rather unique! You see, I am a true survivor! I was once homeless and I suffered burns to my back. I triumphed over my rough start and my burns are all healed up but my back is still sensitive and I have to wear a t-shirt to keep my back protected. It really feels much better when I am covered up and I will have to wear one for life. I get around just like any other cat, but with much more style! LOL! :) I am considered a special needs kitty because of my back sensitivity. I am looking for a special kind of adopter and home so that I can thrive. I want to find someone who is okay with my special needs, which requires medication and lots of attention. A nurse, vet tech, or someone with lots of cat experience would be ideal. I can live with cats but do not mingle with them and I get along with cat-friendly mellow small dogs. I do my very best when I can have someone around a lot and I would like to sleep on the bed at night, too. I do very well when I can have safe outdoor time, such as a kitty porch or catio. This keeps my mind off of my back. :) Check out my YouTube video to see my unique looks! :) My $65 adoption fee includes vet check, spay, vaccinations, negative feline leukemia test, microchip, all medical records, lots of my favorite food, a brand new, tall cat tree!, and plenty of colorful t-shirts for all occasions! If you can give me a lifetime home as a t-shirt wearing feline and if you also have a solid cat history including a veterinarian, send an email to live.love.meow@gmail.com for an application!